06.15.12 Seeking a great dad. No experience required. Before we had our son, my husband barely noticed babies. When we were out and about, I’d coo over every bub I saw, while my husband would kneel down to pet—and, more often than not, have a conversation with—every dog we passed. Our friends started having kids about six years before we did, so there were plenty of babies around, but my husband kept his distance. I distinctly remember when a friend casually handed off his 3-month-old daughter to my husband—he held her at arms length, his expression clearly saying, what am I supposed to do with this? It wasn’t that he didn’t like babies; he just didn’t have that much experience with them. And, as he says, he didn’t want to drop anyone else’s kid. Enough said. When our son was born, that uneasiness seemed to disappear. 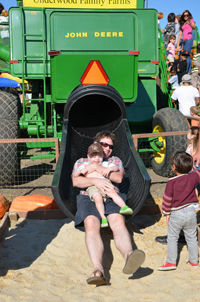 My husband dove head first into being a hands-on dad. He changed diapers, he swaddled and “shooshed” our fussy baby while bouncing on a birthing ball, and he was a huge champion for breastfeeding, solely because I wanted to so badly. When I went back to work, my husband cared for our son two days a week. I don’t think he ever envisioned himself as a part-time stay-at-home-dad, but he took on the role with gusto. They went to the park, and grocery shopping and he took plenty of pics of their time together. While I know some days it was hard for him to be a stay-at-home-dad, he rarely complained. Granted, he would lament that he wasn’t getting enough work done or that there just weren’t enough hours in the day, but he never complained about having to spend his time being on baby duty.